Vending is a core component of virtually every campus card program and for all the talk of how student IDs have evolved over time, vending has come a long way, too. The shift to cashless vending in particular has brought a new wave of convenience and utility to users, and removing the need for cash or coin has been a boon to the industry. As reported by the Vending Times, a new survey conducted by Texas-based Parlevel Systems reveals that some 51% of American adults under the age of 30 prefer non-cash means of payment so much that 51% use credit or debit cards for purchases even for transactions under $5 — the prime vending price range. Parlevel conducted the survey based on its vending operator customers who now use the company’s namesake pay system. Along with the results from the survey, the company pooled existing data from the Web to create an infographic detailing the advantages of cashless readers. “We know that accepting cashless payments is a must to appeal to younger Americans, but what are the tangible benefits of installing a vending card reader?” said Christopher Blomquist, Parlevel’s marketing content manager said in an interview with Vending Times. Part of the increase in spending with cashless could be the result of patrons not feeling the same “pain” when using a card as parting with cash tender. In a study of machines equipped with Parlevel Pay cashless readers in San Antonio, average machine sales per service cycle increased 42% when a vending card reader was installed, Blomquist explains. Of that, cashless payments accounted for 32%, while 10% of the increase was attributed to higher cash sales. Average transaction value was also found to have increased with the addition of cashless capabilities. 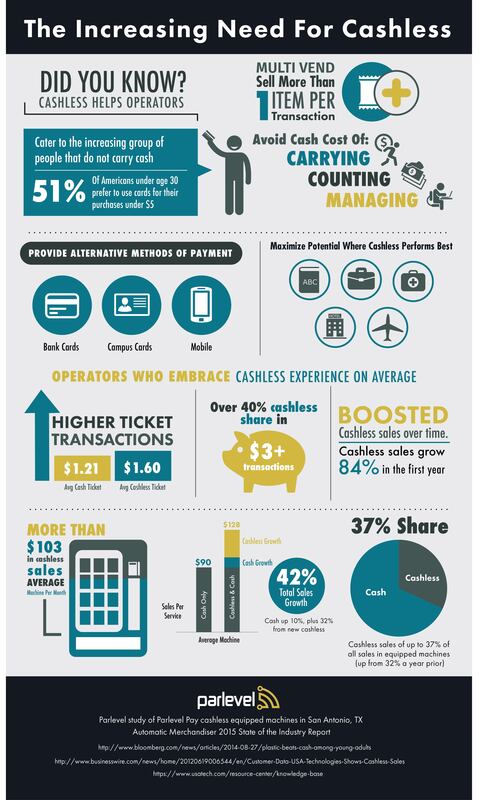 The average cashless vending sale was $1.60, compared to $1.21 average for cash transactions. The survey also indicated that net sales increase with the addition of cashless with an average machine collection of $128 per month, an increase of nearly $40 over cash-only machines. As mobile wallets like Apple Pay and Android Pay grow in popularity, Blomquist also stresses the importance for cashless readers to expand cashless capabilities further still by accepting more than just credit and debit cards.